Download "1.1. Opening Remarks. 1.2. Taxes in Cyprus. 1.3. The Process of Tax Audits in Cyprus. 1 Introduction"
1 1 Introduction 1.1. Opening Remarks After your Cypriot company has been audited and filed the tax return, you do not usually expect any additional tax changes. But in reality the tax story of your company has just started. When the tax return is filed and taxes are paid, you should be prepared to have your company audited by the Tax Commissioner. 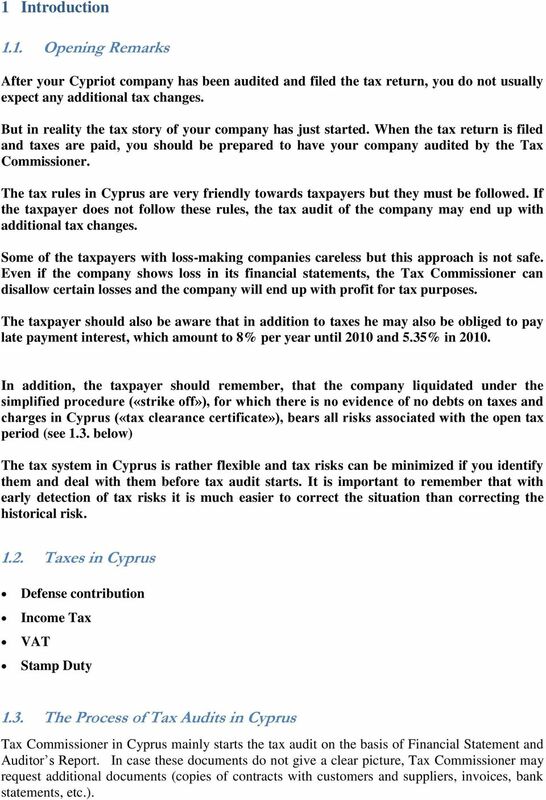 The tax rules in Cyprus are very friendly towards taxpayers but they must be followed. If the taxpayer does not follow these rules, the tax audit of the company may end up with additional tax changes. Some of the taxpayers with loss-making companies careless but this approach is not safe. Even if the company shows loss in its financial statements, the Tax Commissioner can disallow certain losses and the company will end up with profit for tax purposes. The taxpayer should also be aware that in addition to taxes he may also be obliged to pay late payment interest, which amount to 8% per year until 2010 and 5.35% in In addition, the taxpayer should remember, that the company liquidated under the simplified procedure («strike off»), for which there is no evidence of no debts on taxes and charges in Cyprus («tax clearance certificate»), bears all risks associated with the open tax period (see 1.3. below) The tax system in Cyprus is rather flexible and tax risks can be minimized if you identify them and deal with them before tax audit starts. It is important to remember that with early detection of tax risks it is much easier to correct the situation than correcting the historical risk Taxes in Cyprus Defense contribution Income Tax VAT Stamp Duty 1.3. The Process of Tax Audits in Cyprus Tax Commissioner in Cyprus mainly starts the tax audit on the basis of Financial Statement and Auditor s Report. In case these documents do not give a clear picture, Tax Commissioner may request additional documents (copies of contracts with customers and suppliers, invoices, bank statements, etc.). 2 In addition to the above mentioned documents, Tax Commissioner in Cyprus may request to provide documents, which proof the core business, including the company's charter, certificates, contracts with contractors, invoices, statement of bank account, etc. Tax Commissioner in Cyprus may carry out tax audit for the period of six years. Thus, the company can expect an audit for 2010 at any time before the end of This rule also applies to companies that have undergone a simplified liquidation procedure («strike off»). 3 2 Risks of the Defense Contribution in Cyprus 2.1. Defense Contribution in Cyprus on Interests from Bank Deposits As a general rule, interest from bank deposits is subject to defense contribution at the rate of 10% for the full amount of accrued interests. This can be avoided if the company meets all the following requirements and received permission (ruling) of the Tax Commissioner in Cyprus: the main activity of the company is granting loans and / or investments in other financial instruments (not deposits). 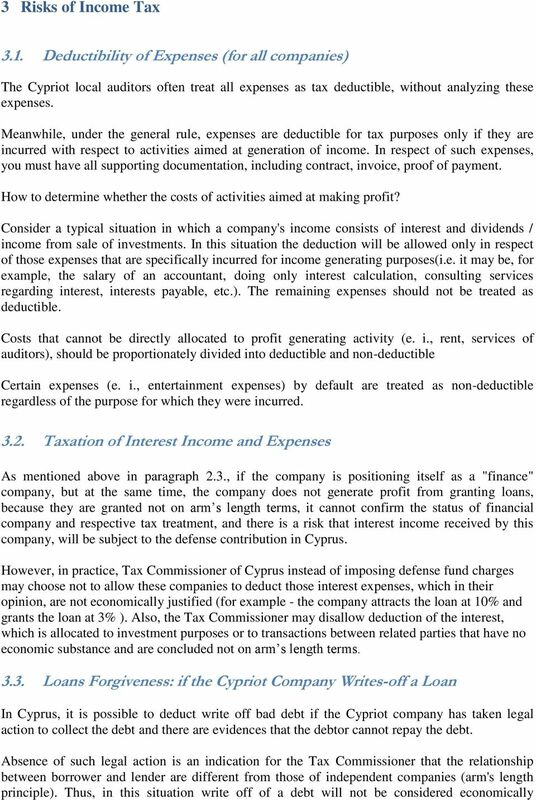 At the same time, income from financial activities must exceed 60% of total income, or 60% of the company's assets are loans or other financial instruments, and interest income excluding bank interest income should exceed 75% of interest income, and net assets of the company shall exceed EUR10 million Defense Contribution in Cyprus on Interests from Granting Loans to Third Parties If a Cypriot company provides loan to third (unrelated) party, the Cypriot Tax Commissioner charges defense contribution on all the interest accrued on such loans. Information about loans from related and third parties, usually comes from financial statements, prepared by the auditors on the basis of taxpayer s information. 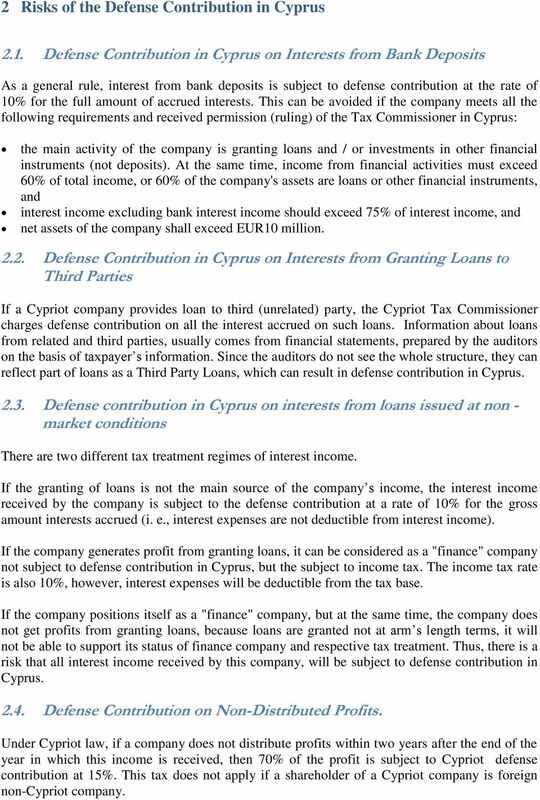 Since the auditors do not see the whole structure, they can reflect part of loans as a Third Party Loans, which can result in defense contribution in Cyprus Defense contribution in Cyprus on interests from loans issued at non - market conditions There are two different tax treatment regimes of interest income. If the granting of loans is not the main source of the company s income, the interest income received by the company is subject to the defense contribution at a rate of 10% for the gross amount interests accrued (i. e., interest expenses are not deductible from interest income). If the company generates profit from granting loans, it can be considered as a "finance" company not subject to defense contribution in Cyprus, but the subject to income tax. The income tax rate is also 10%, however, interest expenses will be deductible from the tax base. If the company positions itself as a "finance" company, but at the same time, the company does not get profits from granting loans, because loans are granted not at arm s length terms, it will not be able to support its status of finance company and respective tax treatment. Thus, there is a risk that all interest income received by this company, will be subject to defense contribution in Cyprus Defense Contribution on Non-Distributed Profits. Under Cypriot law, if a company does not distribute profits within two years after the end of the year in which this income is received, then 70% of the profit is subject to Cypriot defense contribution at 15%. This tax does not apply if a shareholder of a Cypriot company is foreign non-cypriot company. 4 2.5. Cypriot Defense Contribution on an Unpaid Share Capital. In accordance with Cypriot law, if a share capital of Cypriot company is not paid, then the unpaid amount shall be considered as loan to the parent company and is subject to taxation. Tax (10%) is charged on 9% of the outstanding share capital each year. 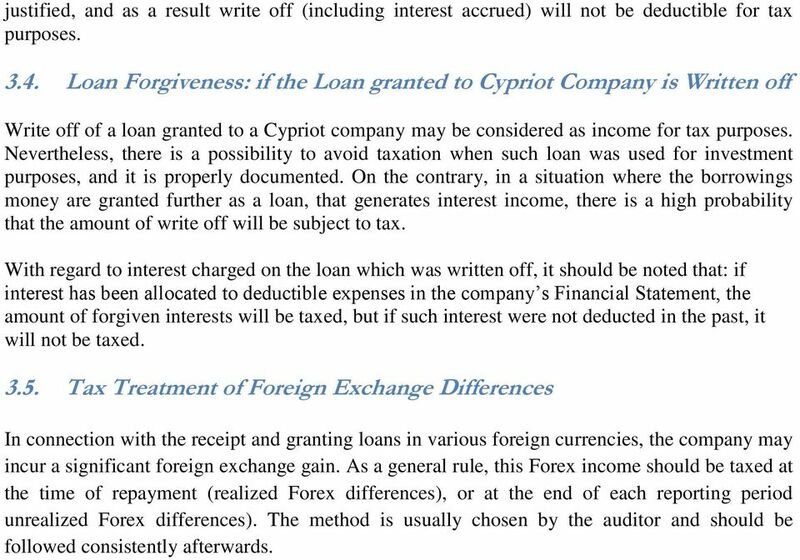 6 justified, and as a result write off (including interest accrued) will not be deductible for tax purposes Loan Forgiveness: if the Loan granted to Cypriot Company is Written off Write off of a loan granted to a Cypriot company may be considered as income for tax purposes. Nevertheless, there is a possibility to avoid taxation when such loan was used for investment purposes, and it is properly documented. On the contrary, in a situation where the borrowings money are granted further as a loan, that generates interest income, there is a high probability that the amount of write off will be subject to tax. With regard to interest charged on the loan which was written off, it should be noted that: if interest has been allocated to deductible expenses in the company s Financial Statement, the amount of forgiven interests will be taxed, but if such interest were not deducted in the past, it will not be taxed Tax Treatment of Foreign Exchange Differences In connection with the receipt and granting loans in various foreign currencies, the company may incur a significant foreign exchange gain. As a general rule, this Forex income should be taxed at the time of repayment (realized Forex differences), or at the end of each reporting period unrealized Forex differences). The method is usually chosen by the auditor and should be followed consistently afterwards. 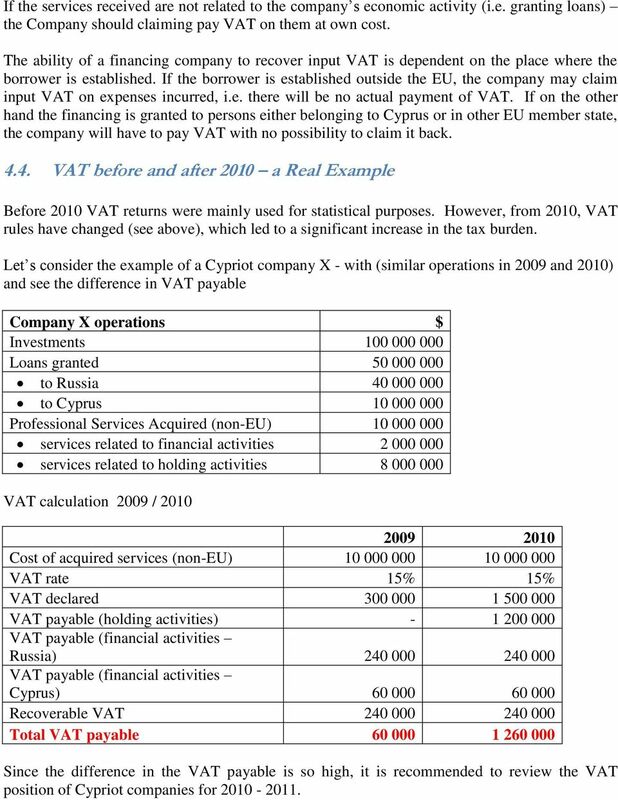 7 4 Cyprus VAT implications 4.1. Obligation to Register for VAT The Cypriot company is required to register for VAT purposes in Cyprus when two following conditions are met simultaneously: The company has economic activities The volume of acquired services exceeds EUR 15,600 during a period of 12 month. In case both conditions are met, the company must register for VAT purposes and file a tax return on a quarterly basis. If the company fails to register and file a VAT return, the company will run the risk of a fine for failing to register for VAT (EUR 85 per month of delay), and fine for non-submission of VAT return (EUR 51 per each VAT return) plus late interest payment, even if the company has no VAT to pay VAT for Passive Holding Companies According to Article 3 of the Cyprus VAT Law Meaning of the Term Business, where an investment holding company whose main business activity is the acquisition of shares (holding) in other companies, without taking part in the management and administration of these companies either directly or indirectly, is considered that it is not performing an economic activity for VAT purposes and therefore is not a VAT person. There are, for example, companies that simply hold shares and have no staff and no other operations in Cyprus. At the same time there are holding companies that are actively engaged in restructuring of its subsidiaries, and their subsequent sale, etc. If the actions of the Company are limited to voting at general meetings of shareholders and the realization of other rights of the Company as a shareholder, it will not be an "economic activity", and the Company will not be recognized as a taxpayer for VAT purposes. If, however, the Company has staff in Cyprus, deals with various projects both in respect of its subsidiaries, as well as prospective investments, search for new investors, the valuation of subsidiary companies, organizations, their funding, etc. the Tax Commissioner may not approve non-registration of the company for VAT purposes. 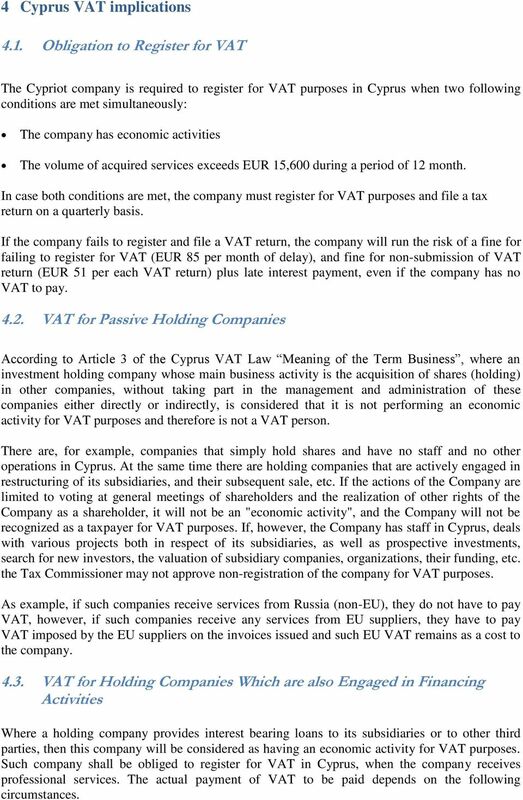 As example, if such companies receive services from Russia (non-eu), they do not have to pay VAT, however, if such companies receive any services from EU suppliers, they have to pay VAT imposed by the EU suppliers on the invoices issued and such EU VAT remains as a cost to the company VAT for Holding Companies Which are also Engaged in Financing Activities Where a holding company provides interest bearing loans to its subsidiaries or to other third parties, then this company will be considered as having an economic activity for VAT purposes. Such company shall be obliged to register for VAT in Cyprus, when the company receives professional services. The actual payment of VAT to be paid depends on the following circumstances. 9 5 Other Relevant Taxes and Charges 5.1. Stamp Duty According to the provisions of the Cypriot legislation, an additional issue of shares is subject to stamp duty of 0.6% of the nominal value of shares issued. However the stamp duty may be reduced through the issuance of shares at premium. TURKEY CORPORATE TAX (KURUMLAR VERGISI) The basic rate of corporation tax for resident and non-resident companies in Turkey is 20%. Dutch limited liability company ( BV ) General Besloten vennootschap met beperkte aansprakelijkheid (usually abbreviated BV in the Netherlands) is the Dutch version of a private limited liability company. STATUTORY BOARD FINANCIAL REPORTING STANDARD SB-FRS 7 Statement of Cash Flows This version of SB-FRS 7 does not include amendments that are effective for annual periods beginning after 1 January 2014. 1 Objectives for Today s Webinar What are the different types of K-1s? K-1 line items where do they end up? My income is greater than the cash I received why would that be? 2 What is a Schedule K-1 Form?